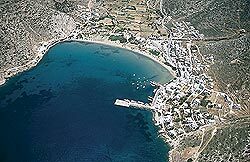 The main district is located to the right of the bay of Kamares, and here you will find, among other things, travel agencies, shops, groceries, restaurants, a news agency, convenience shops, pastry shops, pottery workshops and galleries, rooms to rent, car rentals, and private camping grounds. In the west side of the port are the houses of the well-to-do Siphnians, while on the other side of the bay, at the foothills of mountain Saint Simeon, is the quarter of Saint Marina, also known as Pera Panta, where you will find taverns and rooms to let. Between these two districts of Kamares is a long and wide beach with golden sand.